I send my greetings to sister Suzelle and the staff of Lakay Timoun. My visit there last month was a good experience. I have kept this ministry in my prayers and will continue to do so. The needs and challenges are great. My daughter and I enjoyed being together to serve at the school. We pray that the Lord who gave his servant such a great vision will also send daily provisions for the growth and success of the ministry. He’s able and faithful. Volunteers are needed, welcomed, loved, appreciated, blessed and prayed for. What am I talking about? Where am I referring to? It’s LakayTimoun in Haiti; don’t miss it. Pray, if you will, because it is the opportunity of a lifetime to serve others and to see God’s love in a life-changing way. Arriving in Haiti is intense. I had never been to another country before. It was overwhelming and heartbreaking to see the desperation of the people who attempt to serve you by helping with your bags, because they need tips to survive and feed their families. You’re surrounded, and it is difficult to navigate your way through the sea of people. Suzelle and her husband, Muller, were a welcome sight after we made it through immigration and customs. So, the adventure began. Who knew there were no traffic laws enforced in Haiti? Thankfully, Suzelle’s husband is a pro and we arrived at our destinations without a scratch, bump or major head-on collision. It was so exciting to see this culture and new way of getting around that I laughed with joy the whole time. Haiti is one of the most geographically beautiful places I have ever been: the turquoise oceans, the mountains and the spectacular fruit trees are simply gorgeous. 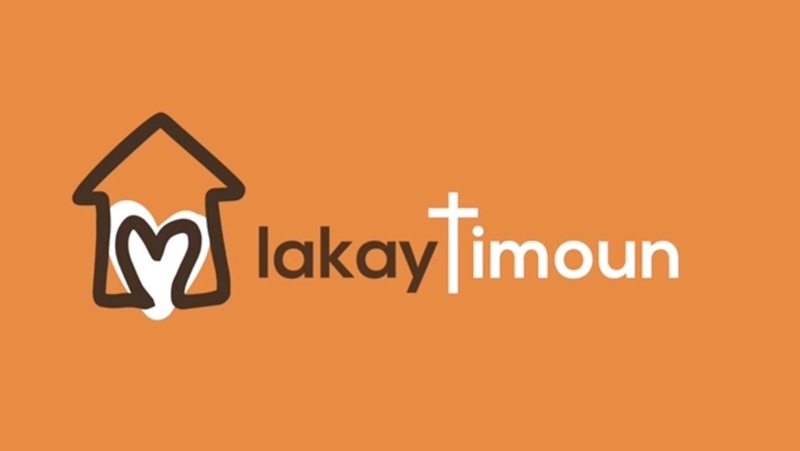 LakayTimoun is working to change their lives. The last day we were there, we had 100 children and teens come for the only meal they would have that day (provided by Suzelle), to play games, to hear about the love of Jesus and to learn. Some walk alone to school, several miles each way, but many—as old as 10—have never been. The needs are so great. Would you please give? Suzelle can’t help these children and their families alone. The work is beyond difficult in every way. God’s grace and strength have sustained her thus far. But there is no electricity where the children live. They sleep and eat in the dirt. Suzelle needs provisions, including a building where she can educated and care for these children, who have little opportunity otherwise. Will you carefully consider how you can help? The love you receive is much more than the love you give. Think about how much time we waste on less important things. If you can, go. And if you can’t, go with Suzelle in spirit through your prayers and financial gifts. I had the pleasure of making a short trip to Haiti in December of 2015 to see what the Lord would have for Suzelle and her ministry. I have always enjoyed going into the mission field and seeing what the Lord is doing in other areas of the world. This trip was no different for me. God did so much in such a short period of time. Arriving in Haiti it was a hot day. I found the city of Port Au Prince to be a very busy place with much activity as people went about their day. The first thing we did when we arrived was head to Muller’s home for a bite to eat. Lunch consisted of fresh fruit that was picked that morning. What a wonderful way to start our trip. We traveled the 4 hours from Port Au Prince to Saint Michel arriving at Suzelle’s sister and brother in law’s home. After a brief visit with them we made our way over to main reason for this trip. To see the property that would become the ministry of Lakaytimoun and to pray to God that He would bless this ministry, bless Suzelle and bless the children and families the ministry would touch. As we prayed I could see in my mind the property we were standing upon filled with children playing on green grass laughing and shouting. The children were so happy and they had not one worry in their little hearts. God was showing them that they could trust Him to meet all their needs and give them a great hope of a wonderful future. We plan on making many more trips to Saint Michel and come along side of Suzelle in the ministry He has given to her. It is with great excitement and expectation that we look to God to reveal His will for this town in Haiti. May the Lord be blessed by the faithfulness of those who will serve in the ministry and minister to the children and families in that area. Because I have been on a number of mission trips to third world countries, the sights in Haiti didn’t seem to phase me. Of course, I was saddened at the conditions of the area, whether it was the lack of clean water, and for the most part, “clean” anything. That’s when I realize how fortunate we are to live where we do. For the Haitian people, in many cases, it’s a way of life. For the Christian person, one must realize that our Savior died on the cross to save ALL people from their sins. With that being said, what can I do to help these people meet the same Jesus I met over 20 years ago, who radically changed the conditions in my life? Really, what can I do? It’s like the story of the boy who stood on the shore of a starfish covered beach, throwing starfish back into the ocean, while the rough surf would just deposit more back onto the beach with every break of a wave. “Little boy,” a stranger said as he walked by, “Your wasting your time, you’ll never save every starfish.” The little boy replied, “I just saved that one”, as he threw another back into the ocean. On our trip to LakayTimoun, one of our main tasks was to build picnic tables for the school. You see, before our team got there, breakfast and lunch was eaten off the ground. My initial thought was “Ok, then what are we going to do?”. Little did I realize how important this little project was for the school children and their families. These tables literally get used every single day. It is such an honor to know that our Lord spoke to someone in our sancturary, Suzelle Pierre-Louis, and said, “I have a purpose for which I created you for”. Suzelle, being obedient to that voice, is like that little boy that brought hope to that beach. One by one, she is leading, not only those children, but also their families closer to Jesus Christ. Not only that, but LakayTimoun is earning a reputation in the city of Saint Michel, as a haven of help. By the grace of God, I will enjoy seeing the spiritual growth and blessing that He brings to that area through LakayTimoun and Suzelle. So back to “What can I do?”. Be sensitive to the voice of God directing me to get involved. Whether it be by being in prayer for LakayTimoun, sending much needed items, financially supporting on a monthly basis, going on the next trip to Haiti, or simply organizing or participating in various fund raisers. Any one (or all of these) will help support this mission. There is no way for us to do it all, but like the boy on the beach, I won’t be satisfied until I do something. My trip to St Michel and LakayTimoun so incredibly blessed me, as I went with the intention to bless others. I can’t wait for the next trip! The Haiti Mission trip was an amazing experience for me. It has opened my eyes and heart to a whole new world. It was a great honor to have participated in the work that God has started with Suzelle and to see her vision come to life. I have realized that the love of Jesus crosses the oceans. His love extends to everyone, but somehow I think his love extends a little more to those children who are served by our friend Suzelle. Good morning, I just wanted to share with you that I had the pleasure of volunteering a day at Lakay Timoun this past August. Suzelle is a God—send to that community. I really like her approach on how she’s helping people to help themselves. A good example is the woman who comes to her for money. Her response? I don’t have the money but I have an avocado tree full of avocados, you can come get them and sell them and earn the proceeds. The woman was so happy to get that opportunity. How great is that? I am looking forward to give back and help out at Lakay Timoun.